Poke The Box by Seth Godin, was an awful book, complete waste of money. It is just one long ramble that could have been summarized in one sentence “Stop thinking about doing something, actually do it.” The book doesn’t provide any good guidance, or examples, or really anything useful. Do not waste money on this book. Do More Faster by David Cohen and Bred Feld, the book is really an advertisement for TechStars, the mentorship-based incubator they founded. There is some good information in the book, especially the practical sections on legal structure and human resources, but most of the book is actually quite boring. Faster, Cheaper, Better by Michael Hammer is what I’m on now. I’m fascinated with Hammer’s reengineering craze that revolutionized business processes in the 90’s and have so far enjoyed this book. I don’t agree with everything inside… those that have worked with me know I am adaminantly against flow charts or process maps, but that is for another post. Piggy-backing on my last entry, I’m also reading a new book called Gamestorming. Those that know me know that I am very interested in innovation and how to get companies to come up with innovative new business models, operational processes, and strategies. Next after Gamestorming, I’m ready to start Do More Faster, which seems to be an interesting book with great reviews on Amazon. If anyone has any other book recommendations for me, please let me know. I’m a big advocate of customer service oriented businesses and operational models focused on exceeding customer expectations, so anything along those lines (as well as anything related to entrepreneurship) would be great. 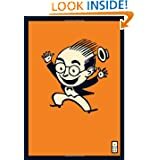 I recently finished Delivering Happiness by Tony Hsieh, which was a great book, and I also highly recommend Creating Magic, by Lee Cockerell. So I went on another little shopping spree like I often do on Amazon, buying up a lot of books. 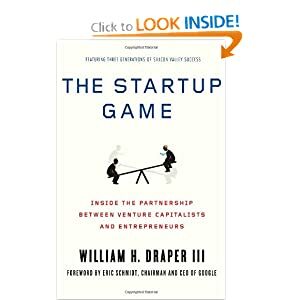 The first one I finished was The Startup Game, a book by Bill Draper, the second of the three generations of Draper Venture Capitalists. For those that may be familiar, Bill’s father was a VC, and his son is the D in DFJ (Draper Fisher Jurvetson) which now has the global VC network. I guess I can also mention that DFJ is one of the investors in GoodGuide. That being said, the book is alright. If you are looking for insights on being a venture capitalist, what it’s like being in the industry or working with VC’s as an entrepreneur, etc… you will find very little of value in this book. There is some high-level information, sure, but you won’t come away with a wealth of new knowledge and insight. The book reads more like an autobiography, telling the life of Bill Draper, from leaving a cushy job at a young age to join his father out West in what would be Silicon Valley. If you are interested in the journey and Bill’s life as a VC as well as his service in the government for over a decade, you will find this book enjoyable. I’m not one for reading autobiographies (although Richard Branson’s “Losing My Virginity” is one of my favorite books), but this was a pleasant read. Tune in to your local public radio station tonight to hear an interview I did with Scott Tong from American Public Media. The segment will be on over 500 radio stations tonight during the Marketplace report. In the interview Scott and I talk about the proliferation of eco-labels, how they are impacting consumer purchasing behavior, examples and traits of successful labels, and thoughts on the launch of the WindMade label. WindMade is a new certification being announced tomorrow in Davos at the World Economic Forum. It is a collaboration between WWF, Vestas Wind Systems, and PricewaterhouseCoopers. The standard is not yet publically available and public comment is expected in March. The standard technical committee is only made up of the three organizations listed above with the standard expected to be finalized in May, so it will be interesting to see if this consortium develops a rigorous and credible standard in such a short timeframe. As more information is available on WindMade, I will post a full write-up. A new event that looks to be an insightful few hours of dialogue with some of Chicago’s most successful entrepreneurs is coming February 8. The line-up includes many notable names, including some that have been speaking quite a bit at other local events recently. Come to the Greenhouse Theater in Lincoln Park to hear from Genevieve Thiers and Dan Ratner, founders of SitterCity and now ContactKarma, Mari Luangrath, founder of FoiledCupcakes, Matt Maloney, founder of GrubHub, Ross Kimbarovsky, founder of crowdSPRING. You’ll notice several of these names from the lineup of Seed10, put on by the Polsky Center a couple months ago. They are all great speakers with tremendous success, so hopefully there will be some great new content shared with the audience. I look forward to seeing many of you at the event! 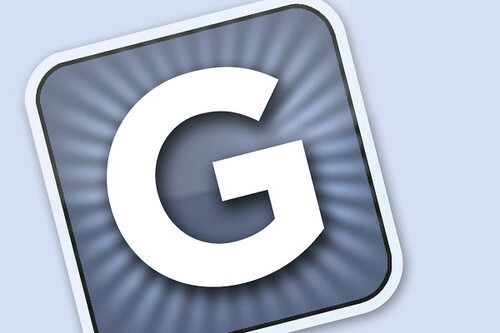 GoodGuide is preparing to launch ratings for dog and cat food. This will be the first of its kind ratings for pet food, looking at the health of the food along with the environmental and social performance of the companies that make the food. In total, 1500 products were evaluated from 50 brands. There are a lot of myths floating around about the health of pet food and many misleading marketing claims. In fact, I would argue the greenwashing of marketing claims for pet food is larger than for consumer goods. DePaul students or recent grads- get ready for Launch DePaul, the annual new venture competition, with a top prize of $10,000. Launch DePaul is a new venture competition for businesses, non-profits, and social ventures, and is open to the DePaul community. The competition emphasizes the ability of teams to demonstrate the sustainability of their ventures, illustrated by the achievement of milestones and/or documentation of market potential. I look forward to judging the first round and seeing some of the great submissions from students.